The Click 2 addresses the issue of portability with an extremely compact form factor that can deliver above average audio with a surprisingly high volume. 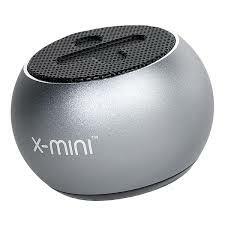 The iconic X-mini™ shaped to fit snuggly in the palm of your hand. Pair two X-mini™ CLICK 2s to power up and enjoy true wireless stereo audio performance. More than just a pocket-sized portable speaker, the X-mini™ CLICK 2 has a built-in remote camera shutter so you can listen to your favourite tracks and capture your favourite moments in style.